The reasons why Colin Kaepernick should stand during the national anthem, ranked. 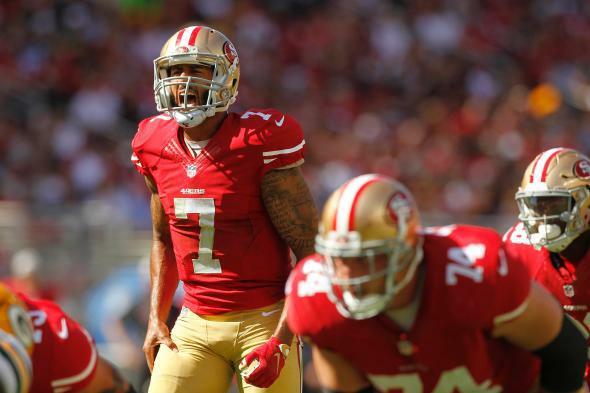 Colin Kapernick during an Oct. 4, 2015, game in Santa Clara, California. On Friday night, San Francisco 49ers quarterback Colin Kaepernick chose not to stand as “The Star-Spangled Banner” played before his team’s preseason game against the Green Bay Packers. Kaepernick later explained that this was an act of protest against the oppression faced by black Americans and other people of color in the United States. “There are bodies in the street and people getting paid leave and getting away with murder,” he said, referring to high-profile incidents in which police officers have not been prosecuted for inappropriate uses of deadly force. As you might imagine, Kaepernick has come under heavy attack. Here, from most to least incoherent, are the reasons critics have given for why they consider his protest reprehensible. I’ve also included Kaepernick’s responses to those criticisms, which he elucidated when he met with the press on Sunday. 7. What about black-on-black crime, though? Stephen A. Smith, ladies and gentlemen. We’ve been over this one before, and thankfully no one has been dumb enough to ask Kaepernick about it. My God. 5. He’s rich and therefore not himself oppressed. 4. Black people in America actually have it great. 3. He doesn’t know enough about the issues, which are none of his business anyway. 2. He’s just doing this to get attention because he’s not good at football anymore. Weird how Kaepernick stood for the anthem until like a week before he was probably going to be cut for poor play on the field. Hmm. Strange. 1. Respecting the anthem and flag by standing represents an endorsement of the United States’ ideals, not of every one of its actions. You stand for the anthem in respect to those who fought for what it should represent, not for what it sometimes does. That explanation—like the rest of what Kaepernick said on Friday and Sunday—makes sense, doesn’t it? We can debate the beliefs the quarterback espouses on Twitter and elsewhere, but if Kaepernick’s critics can’t come up with better material, then they’d be better served taking a seat on the bench.